The food supplements category is comprised of concentrated foods that provide additional nutrient value to a person’s diet when combines or taken in conjunction with food. Products such as brewer’s yeast are rich sources of protein, vitamins, minerals, and amino acids—in the same forms as they occur in nature. Some food supplements can be mixed with juices, sprinkled on salads or cereals, and incorporated into breads and sauces. Others are offered as tablets or capsules for easy and palatable ingestion. Still others are available in concentrated forms that provide optimal nutritional benefits in small, manageable portions. A broad variety of food supplements. 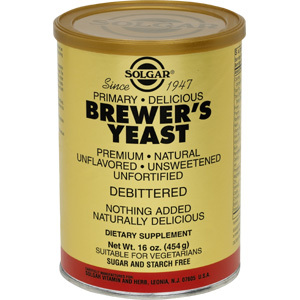 SOURCE: Most Brewer's Yeasts are derived from the fermentation of beer. Such fermentation involves using grain (rice, wheat, etc. ), malt, active yeast and the dried flowers of hops. The addition of hops to the fermentation gives a characteristic flavor to beer but imparts a bitter taste to the dried Brewer's Yeast obtained as a byproduct. 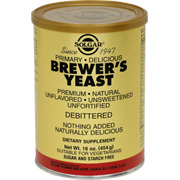 Although efforts are made to debitter the yeast prior to final drying operations, most Brewer's Yeast are, nevertheless, left with a detectable bitter odor. Solgar's Brewer's Yeast Powder is free of corn, wheat, soy and dairy products and is formulated without the use of preservatives, artificial flavors or colors. As a dietary supplement for adults, take two (2) tablespoons daily. May be sprinkled on cereals, salads or incorporated into stews, soups, sauces, gravies, juices or baked goods. CAUTION: PHENYLKETONURICS (PKU): This product contains phenylalanine. Brewer's Yeast Powder is shipped in a discrete, unmarked package. Orders are processed immediately and usually take about 3 to 5 working days to be received. We do ask that you try it for 2 to 3 weeks to feel the full effects. Any information received is used only for order processing and shipping purposes. Your information, such as e-mail address, will never be disclosed to a third party.